Whether your child is working on kindergarten readiness skills or is already in school, tasks requiring fine motor skills can often present difficulties. While many children don't have trouble with gross motor skills such as running or jumping, fine motor skills require more control and more precise movements of smaller muscles. As fine motor control is a very important skill to master for writing, you'll want to make sure your child is continually improving those skills. Here are some fun activities to try at home to build up that motor control. Hide small objects like coins or beads inside a lump of Silly Putty, modeling clay or homemade play clay. Have your child pull off pieces of the clay, using one finger and his thumb until the objects are revealed. You can also give your child a ball of the clay and have him practice pinching. It may be one of the few times you actually encourage him to pinch. String large beads on a shoelace or piece of yarn with the end wrapped in tape. If you don't want to invest in beads, rigatoni noodles are the perfect size for this activity. You can even dye them different colors. Simply put some of them in a large, reclosable bag with a few drops of rubbing alcohol and some food coloring, shake until it's distributed and place the noodles on a layer of paper towels to dry overnight. Transfer small items from one bowl to another using a clothespin. Again, coins or beads would work well for this activity. A variation is to use plastic tweezers to transfer grains of rice or Cheerios from one container to another. Spray a dollop of shaving cream on your kitchen counter or table and have your child smear it into a thin layer. 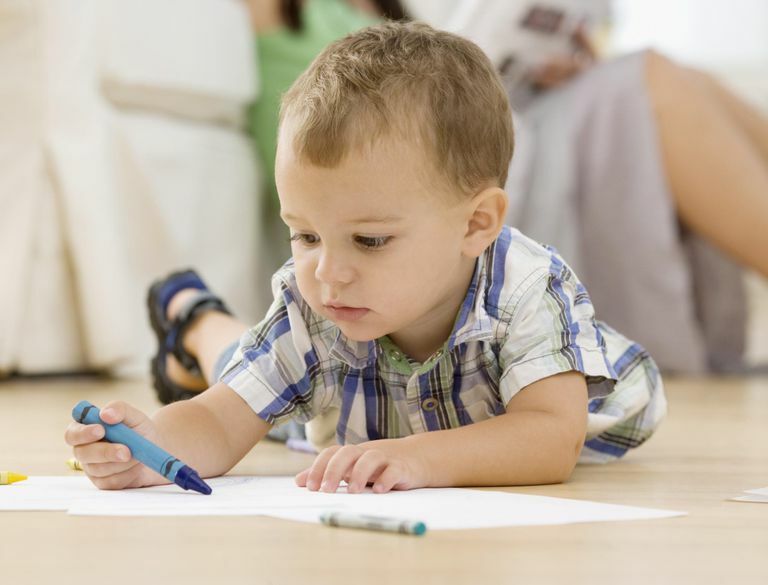 Have him use his index finger to practice writing letter, shapes, his name and to draw people. When he's done, give him a small, clean, damp sponge to wipe away the shaving cream in a side to side motion, encouraging him to use his arm and wrist and not to move his shoulders. A bonus of this activity is that the shaving soap will leave your table incredibly clean, even removing stubborn food stains. Rip paper or newspaper into strips, placing both hands on the top of the page and pulling in opposite directions. Have your child put one strip at a time into the palm of his hand and try to crumple it into a ball using just the fingers of that hand. To increase the strength in both hands, remember to have him switch hands. Use scissors to cut newspaper into strips or make paper snowflakes. The goal is to give your child a chance to develop a proper scissor grip, so it doesn't matter whether or not his creations are pretty or even recognizable. Invest in toys that use fine motor skills while your child is playing. For example, lacing cards, Legos, peg boards, Magnetix, and erector sets all require good fine motor control. Provide your child with dot-to-dot pages and stencils to trace. If he's having trouble using a pencil or thin marker, have him begin with a thick crayon or thick marker. Tape a large piece of paper to an easel or the wall and have your child practice drawing a line from the top to the bottom of the paper. Play the add-a-line game. On a large piece of paper, draw a simple shape or line. Take turns connecting a different shape or line to create a new object. You can continue doing this until the paper is full or your masterpiece is complete. Be creative and use curvy lines and a variety of different shapes, encouraging your child to do the same. Note: Once your child is ready to move on to a regular pencil, buy a package of golf pencils. Since they're short, the pencils are perfect for little hands and naturally promote a correct pencil grip.